Every once in a while, someone asks me how a marathon compares to randonneuring. Running versus randonneuring was also a recent topic on the “randon” list, one of the main randonneuring listservs. Having just completed a marathon as well as a flèche and a 300K within a month’s timeframe, I thought I’d share my own experiences of both. Overall, I’ve found the two activities a challenge to compare, but if I had to make a call I would say a marathon is most similar to a 300K brevet in terms of effort and toll on the body. That is obviously a rough comparison, as all rides and runs will vary depending on conditioning, the terrain of the course, and the weather during the event. Running is more stressful on the body mile per mile, and it generally takes me a few days to lose my post-marathon stiffness. It takes me longer on the bike to get to that level of post-ride stiffness, and when I do, it feels more localized. A marathon’s after-effects are noticeable in my quads, calves, hamstrings, core, and adductors. I feel the effort of a ride primarily in my quads, hips, lower back, ankles, and sometimes my neck. My skin gets more beat up from being on the bike over a long effort than when running a marathon. This is probably due to being out in the elements longer, generating our own wind (does that make sense?) while riding, and riding on the open road as compared to running in an urban environment that is overall more sheltered from the elements. All but one of the marathons in which I’ve participated have taken place in cities. Food I can easily digest while riding, I would not even consider eating during a run. My stomach is much more sensitive when running, maybe because it gets jostled around more than when I’m on the bike. With rides that are 300K and longer, you are not only recovering from the effort of the brevet but also managing some sleep deprivation, as all rides over 300K distance require starts of 5 a.m. or earlier (at least when you ride with D.C. Randonneurs), and I almost never go to bed before 10:30, even on brevet eves. Marathons generally start later, at 7 or 8 a.m.
Those are some of the physical differences that I’ve encountered. My approach to running also varies distinctly to that of randonneuring. For me, running is primarily a solitary activity. I don’t have a regular running buddy and I train by myself. In contrast, almost all randonneuring is a team effort with Felkerino. 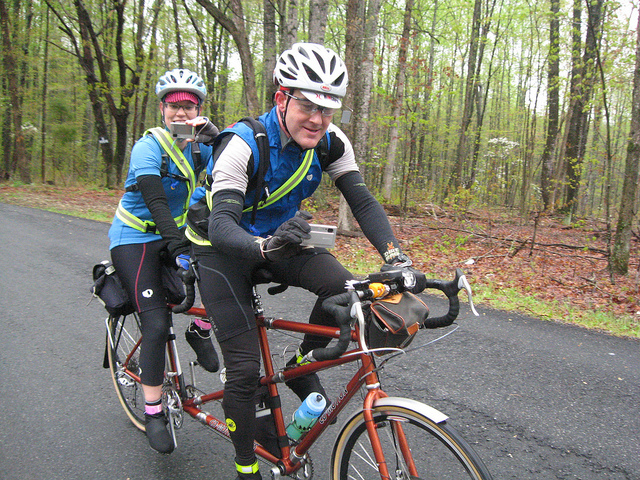 We train together, set randonneuring goals as a team, and ride almost all brevets on tandem. I fit my running events in around Felkerino’s and my randonneuring calendar. 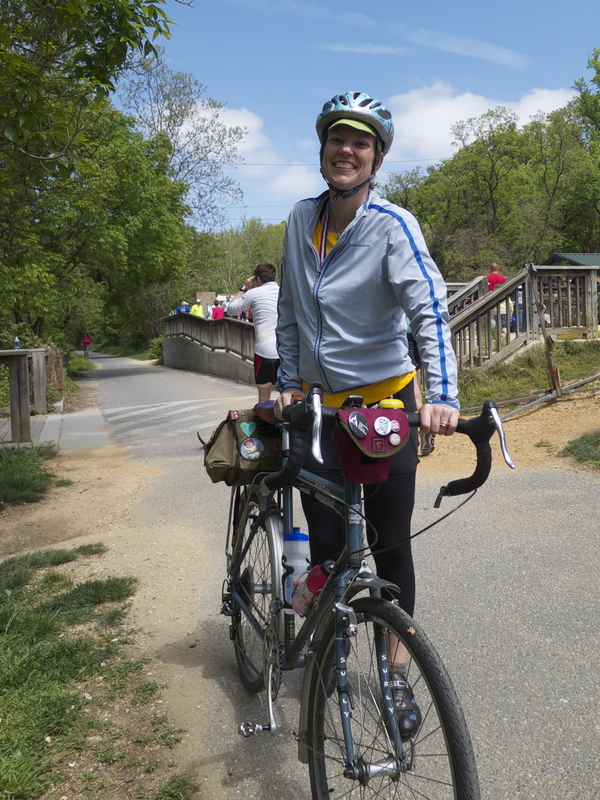 That works well, as spring marathons in the D.C. area happen just before the brevet series really gets going. By the time fall rolls around, the Super Randonneur series has come and gone and Felkerino and I have usually completed any big bicycling events we planned, be it a tour or other activity. Fall is prime time for running. I like maintaining a good base of running and cycling fitness, as I’ve found it wards off burnout with either activity. I like keeping a foot in both communities, as they are both quite different. Also, I think it’s important to balance out my cycling with a weight-bearing activity like running, especially in light of my family history with osteoporosis. Brevet entry fees are much more reasonable. Thirty-five dollars for 375-mile bike ride is a bargain in my book. Brevets require more complicated staging, particularly the longer rides, because you are out in the elements longer during a brevet than a marathon. They are generally farther from home. Running generally requires less gear, and I can more easily find marathons that start within Metro-, walking- or cycling distance of my house. A brevet requires more gear than a marathon, and during a marathon you are highly unlikely to experience a mechanical (just your body breaking down!). Marathons draw more people than a brevet. The marathon I ran this past weekend had a field of 300 people. That’s a tiny marathon, but it would make for a huge brevet. You will also find more women at a marathon than you will riding brevets, something that I hope will change over time. Marathons have more of an event feel (except for Paris-Brest-Paris, which also has that incredible event vibe). That is not good or bad, it’s just different. 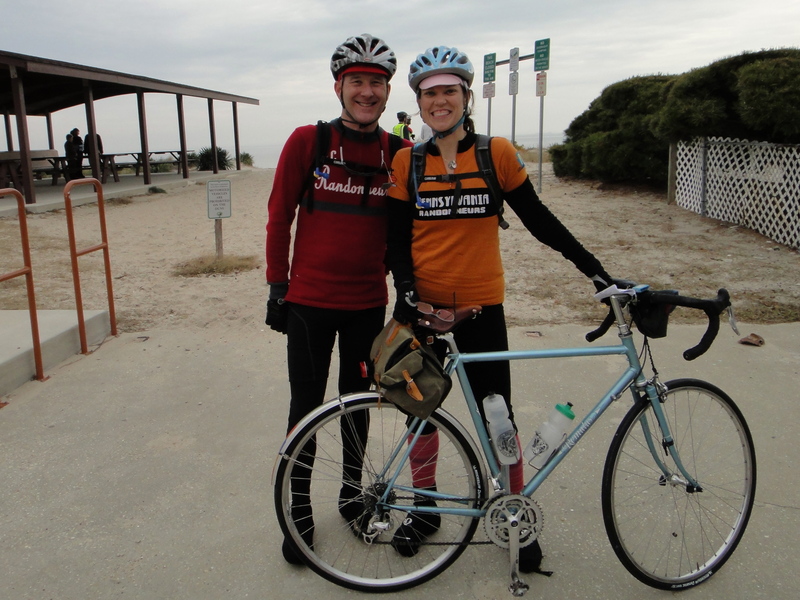 When I show up at a brevet, I generally recognize most of the other cyclists… and their bikes. It’s an intimate community. 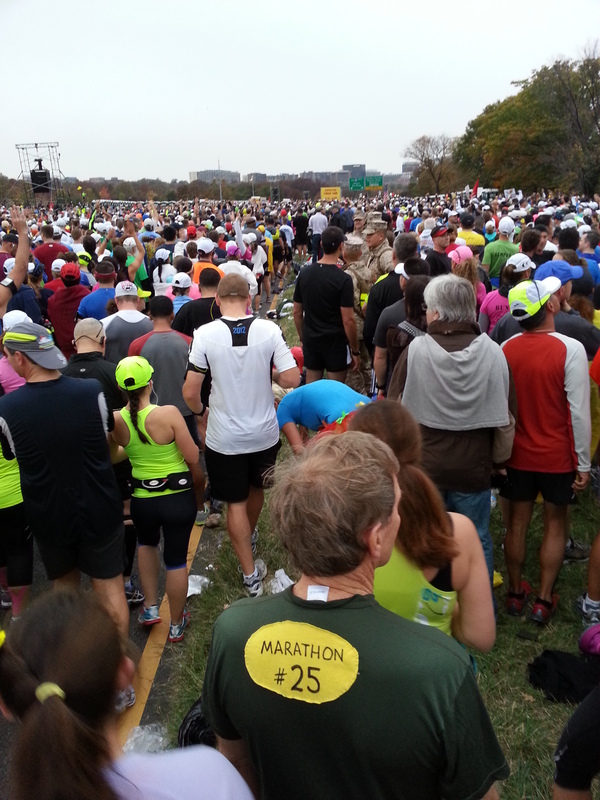 However, it’s also fun to show up at a marathon with a big field and be part of a big happening. The marathon is a distance and activity that resonates with people. Marathons are on a lot of people’s bucket lists. Most people don’t think you’re off your rocker for wanting to run 26.2 miles at least once in your life. They think it’s amazing. The appeal of randonneuring, on the other hand, is not widely understood and often gets one of many variations of the “you’re crazy” response when I try to explain it. Randonneuring’s attraction, and even its existence, is still mostly a secret shared among the relative few who do it. I’m glad I don’t have to make a choice between randonneuring and running marathons, as I find that one makes me appreciate the other. Both of them, however, do share a few common elements. They challenge me to set goals and work steadily toward them. Both are excellent endurance tests for my body and mind. I’ve met some good people through my runs and brevets. And every time I ride a brevet or run a marathon, even in the rough or uncomfortable moments, I’m reminded of what a gift it is to be alive and to directly experience this world. What about you? I’m curious how you would compare the two. I want to know how you keep your body healthy for both. Massage? PT? Strength training? What keeps you balanced and flexible? First, I confess that I am not an extremely flexible person to begin w/. However, I’ve been able to balance both and not suffer injury by doing a lot of strength training and making fairly regular use of the foam roller. I’ve never done a brevet but have 7 marathon finishes to my credit. I was shocked when I saw post race marathoners walking downstairs backwards. They’d completely obliterated their quads. Then I tried walking downstairs and had to turn around and descend in reverse. Fascinating comparison. I am in awe of your ability to undertake both activities with such grace and confidence. Sounds very fulfilling. I only run when I’m being chased or when I’m about to miss a train, so when the orthopedist told me that I needed to give up running after my accident, there was no love lost. Weight bearing activity is important, though. I have been shocked by some of the studies I’ve read about the impact of cycling on bone health. Great comparison. I have run one marathon and have signed up to run my second on 4 August. I have just got into Audax since January. The biggest thing I like about randos is that they are non-competitive while marathon runners all seem to talk about times and PBs. I agree about the difference in cost … I love that randos are cheap $6 entry + maybe $20 support fees for a 300km ride (we don’t have as many shops along our rando routes) and hate that marathons are so expensive ($100 for a cheap marathon). I also love that randos are small fields (we have rides with as few as 3 riders and rarely more than 10), though being part of the throng of humanity that is a marathon can be pretty cool. The furthest I’ve gone on a bike is half a century. After the ride, a bunch of us ultrarunners stood around exclaiming about the difference in soreness and stiffness (or lack thereof) muscles/feet etc and how enjoyable it was we weren’t hobbling around … my neck definitely was my weak link though. MG, my ultra friends and I do some trail miles most Thursday mornings, early — come join us once in awhile! Yes yes yes, I would love to! That is one durable athlete! Amazing. I wonder how he or she would compare the two and how they maintain the level of fitness necessary to engage in both activities at that level without getting injured or experiencing burnout. Have done a three 200 kms brevets (completed 2), a 300 kms and a 400 kms. Might be because of the timing of the year they were done, with the 1st 200 in August 2012 (fag end of summer in South India), the 2nd in November 2012 and 3rd in February 2013, the 300 in December 2012 and 400 in January 2013, I felt the 400 kms was easier than the August 200, but the 300 was pretty tough. Attempting a 600 kms this month. And of course the longest Marathon distance I have run was a Half Marathon 21.1 kms distance (barefoot) which was pretty tough on country trails. I think one drains out much faster running marathons, but riding brevets is the real endurance test, especially when we talk about riding longer than 300 kms distance, it is all in one’s mind!